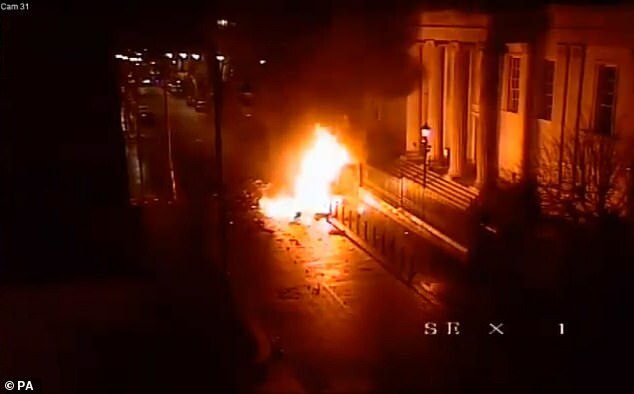 CCTV shows the moment a group of young people walk past a pizza delivery vehicle minutes before it exploded in a bomb attack blamed on the New IRA. 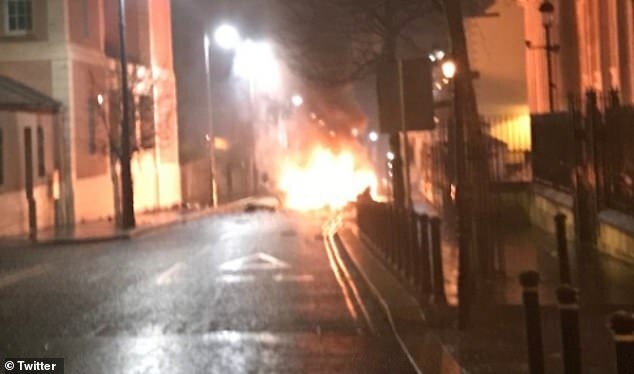 A fifth man was arrested today by police after armed men hijacked the car and left it outside a courthouse in Londonderry on Saturday night before it burst into a fireball. 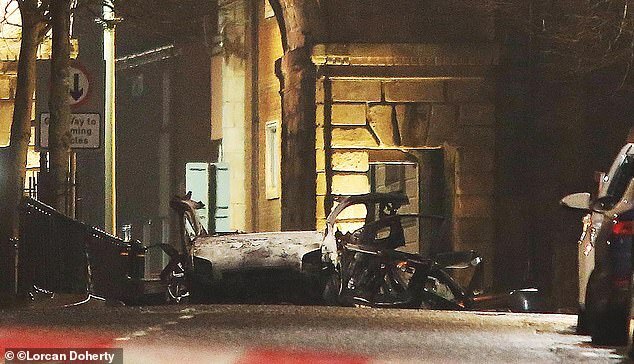 The latest arrest came as shocking footage emerged showing the blast in the quiet city centre street just before 8.10pm – just 30 minutes after a group of seven came within just yards of it as they strolled past. The area was later evacuated after a phone call was made the Samaritans in the West Midlands which tipped off police. Nobody was injured in the attack. A man in his fifties was arrested today and detained under the Terrorism Act. Four men arrested on Sunday remain in police custody. 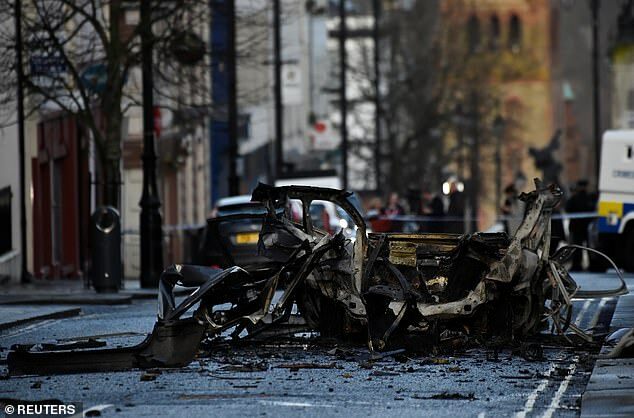 Political leaders called the explosion an ‘act of terror’ and warned that the ‘dark days of the past’ could return to the province, as police pointed the finger at the New IRA, a dissident republican group they called ‘small and unrepresentative’. 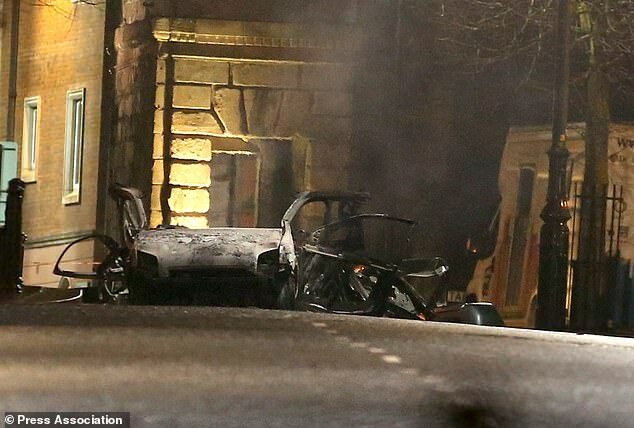 DUP leader Arlene Foster called the blast a ‘pointless act of terror’ while the Alliance party said it was ‘an attack on everything we have worked towards over the past 20 years’. Yesterday Assistant Chief Constable Mark Hamilton said: ‘Our main line of inquiry is against the New IRA. ‘The New IRA, like most dissident republican groups in Northern Ireland, is small, largely unrepresentative, and determined to drag people back to somewhere they don’t want to be. 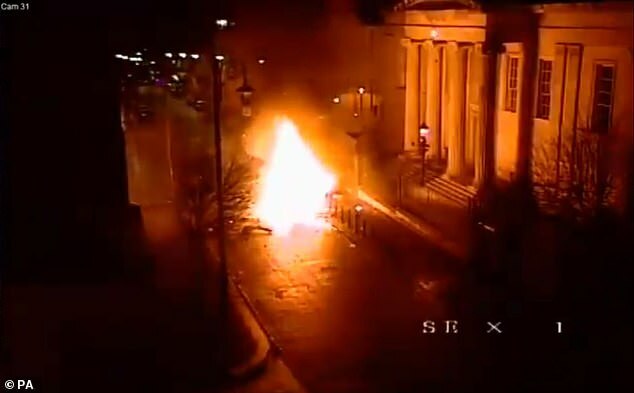 Describing the attack, he said: ‘A bomb was put in that car, driven at least half a mile to outside the court house on Bishop Street and around three minutes later a phone call went in to the Samaritans in West Midlands in England, which was then passed to West Midlands Police who then contacted us. One local resident, Greg McLaughlin, told BBC News the explosion had shaken his windows. He said: ‘It was very, very loud. I knew right away this was a bomb. We knew it was quite close. 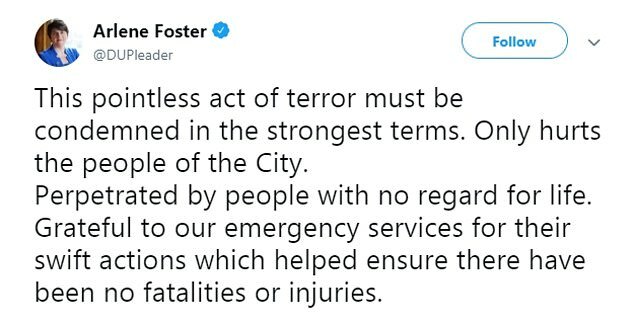 DUP leader Ms Foster said on Twitter: ‘This pointless act of terror must be condemned in the strongest terms. Alliance party leader Naomi Long said: ‘I, like many in the community tonight, am completely appalled and disgusted at this murderous attack. ‘[It is] an attack on our peace, our prosperity and everything we have worked towards over the past 20 years, and an attack on the people of Derry-Londonderry. ‘It is absolutely sickening that there are still people willing to bring violence to our streets and risk people’s lives and livelihoods. Sinn Fein have also condemned the explosion, saying: ‘This incident has shocked the local community. In particular, there are many elderly residents who live in the area who have been alarmed by this incident. 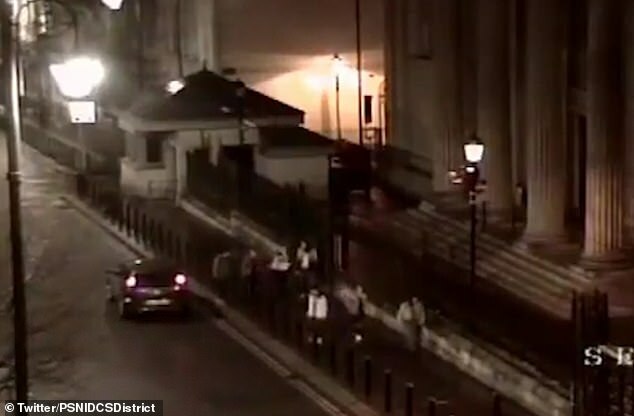 Police described the attack as ‘unbelievably reckless’ as forensic officers took to the scene. Assistant Chief Constable Mark Hamilton said: ‘Thankfully the attackers failed to kill or injure any members of the local community out socialising and enjoying the best of what the city has to offer. 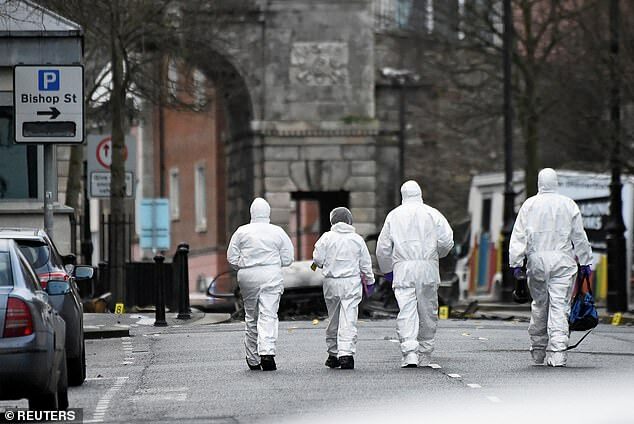 Police sealed off the scene as they responded to the blast and checked a second suspicious car, saying they were dealing with an ‘extensive crime scene’. 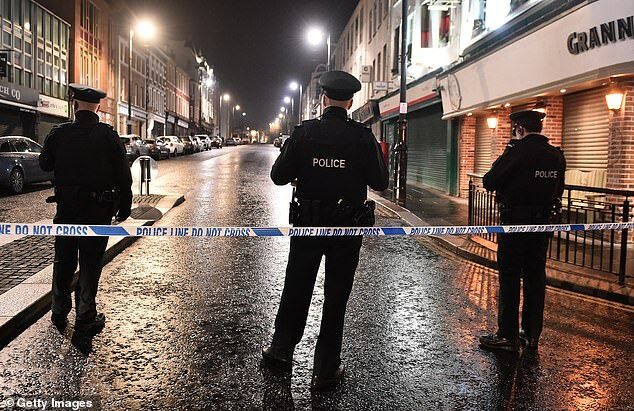 Representatives of the retail and hospitality industries in Londonderry have also condemned the car bomb attack in the city as ‘shameful’. Retail NI chief executive Glyn Roberts described the attack as ‘totally shameful and despicable’. ‘Derry city centre traders have been working extremely hard in recent years to provide an excellent retail and hospitality offer,’ he said. Colin Neill, chief executive of Hospitality Ulster, said a number of businesses affected by the attack had opened as normal on Sunday. ‘We are a resilient bunch in the hospitality sector and this incident last night will not deter us from opening today and getting on with the job,’ he said. 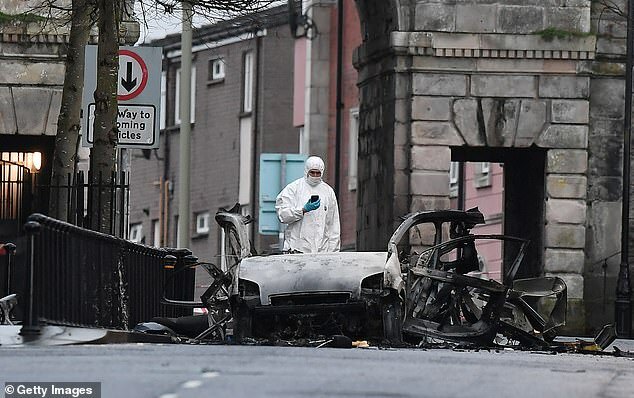 The Bishop of Derry and Raphoe Ken Good described the bomb attack as an ‘act of utter recklessness which showed a callous disregard for the lives and safety of local citizens and visitors alike’. 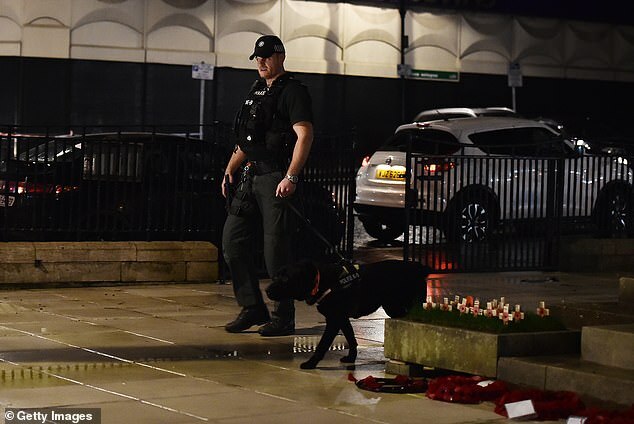 ‘It defies belief that anyone would place a bomb on a city centre street, early on a Saturday evening, so close to people’s homes, churches, a hotel, sheltered accommodation, nearby pubs and a large car park. 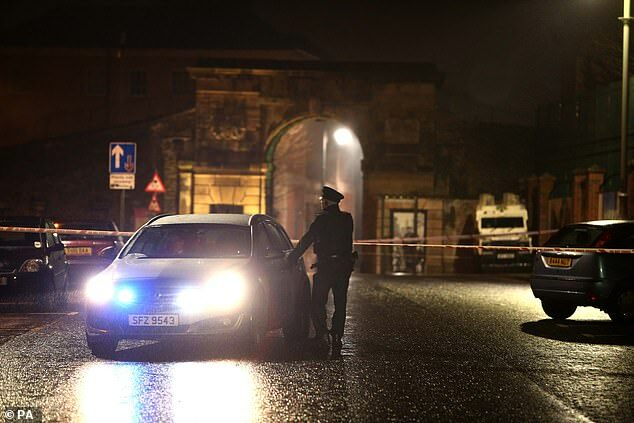 ‘St Columb’s Cathedral and St Augustine’s Church, where a group of young people had been meeting yesterday evening, have both had to cancel their Sunday morning services while the police carry out a follow-up security operation,’ he said. Officers were on the scene quickly as they were already responding to the hijacked delivery van, the Irish Times reported. 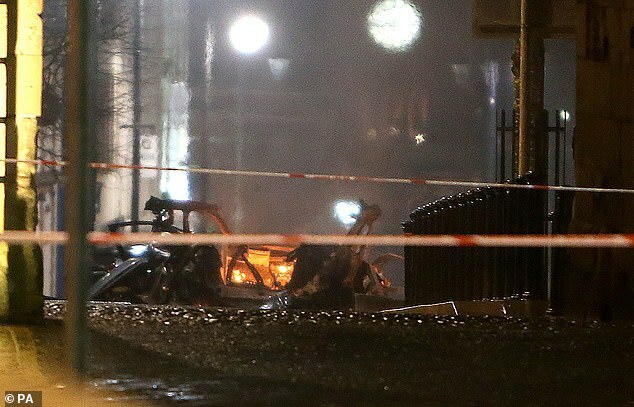 The Police Service of Northern Ireland said on Twitter: ‘As far as we know no one injured. There are ongoing necessary evacuations. ‘If you live Bishop Street or Bishop Street Without look at potentially making preparations to leave. We can only apologise for any inconvenience. Witnesses earlier said they heard a loud bang and saw a large plume of smoke with local residents, including those in a sheltered housing complex for elderly people, being evacuated from the area. 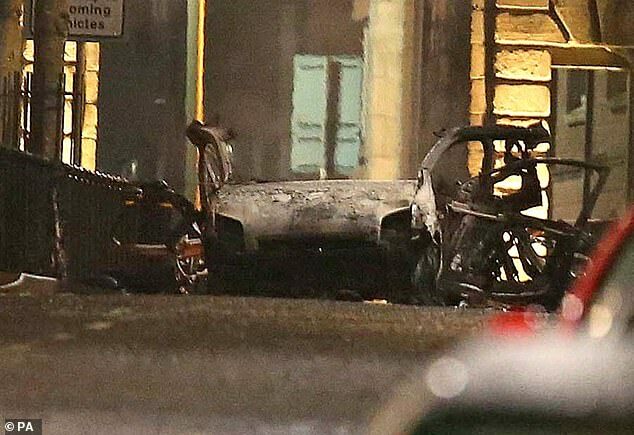 Local SDLP MLA Mark H Durkan tweeted: ‘Whoever is responsible for this explosion outside Bishop Street Courthouse in Derry clearly hasn’t got the message that the people of Derry DO NOT want this on our streets. The incident happened just a few miles from the Irish border as the Republic of Ireland prepares to mark the 100th anniversary of its war of independence. The first shots of the war, which saw the southern 26 counties of Ireland become independent of the United Kingdom in 1921 before going on to become the Republic of Ireland, were fired at Soloheadbeg, Co Tipperary on January 21 1919. 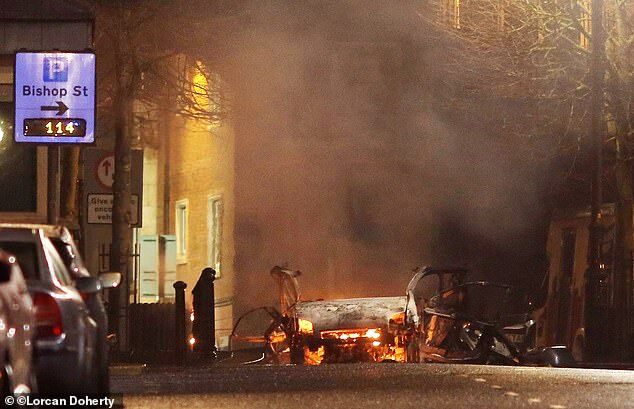 Violent dissident republican groups have been responsible for a number of murders over the last 10 years. They include the killing of Sappers Mark Quincey and Patrick Azimkar outside Massereene Barracks in Co Antrim in 2009 and PSNI Constable Stephen Carroll in Craigavon, Co Armagh in the same year as well as Constable Ronan Kerr in Omagh in 2011. Dissidents were also responsible for the murders of prison officers David Black in 2012 and Adrian Ismay in 2016. There have also been a number of narrow misses, including the maiming of Constable Peadar Heffron in 2010, when an undercar booby trap bomb left him seriously injured.